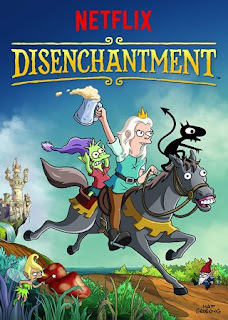 Recently, I sat down to watch the first three episodes of show runner Matt Groening's newly released Netflix series “Disenchantment”. This marks his third outing as lead creator of an adult focused cartoon - his first two, the highly acclaimed “Futurama” and the legendary “The Simpsons”. Groening and his team once again bring crude humor and a cast of unique and out there characters to the screen to make audiences laugh, while providing some subtle social commentary. The show follows the princess Bean who lives in the fantasy kingdom of Dreamland. The rebellious youth is compelled constantly to go on misadventures by the prankster demon Luci, and the meek, affable Elfo the elf. The three have to contend with a cruel king, a self-absorbed prince, and many other fairy tale tropes that aren't given a twist to suit the comedic nature of the show. I had high hopes going into the series. As a massive fan of Futurama, the shows similar art style seemed like a return to form. There were some growing pains, however. The pilot episode was awkward and many of the jokes fell flat. As it went on though, the chemistry of the cast began to mesh far more naturally. Even characters I initially did not like ( the prince was a standout) were quick to turn about and become charming, even in their obvious arrogance. By the end of episode three I could see that the potential in this Netflix original was quite apparent, and I am eager to dig in for more. I would suggest this show to any fan of Groening's first two shows, as well as teens and up that enjoy crude, yet lighthearted adventures.